A team led by astronomers from Carnegie Institution for Science have discovered twelve new moons orbiting Jupiter. This brings the total number of known moons around Jupiter to 79. Nine of the new moons revolve around Jupiter in a distant retrograde orbit, moving in the opposite direction of Jupiter's spin rotation. They are believed to be the remnants of three once-larger parent bodies that broke apart during collisions with asteroids, comets or other moons. 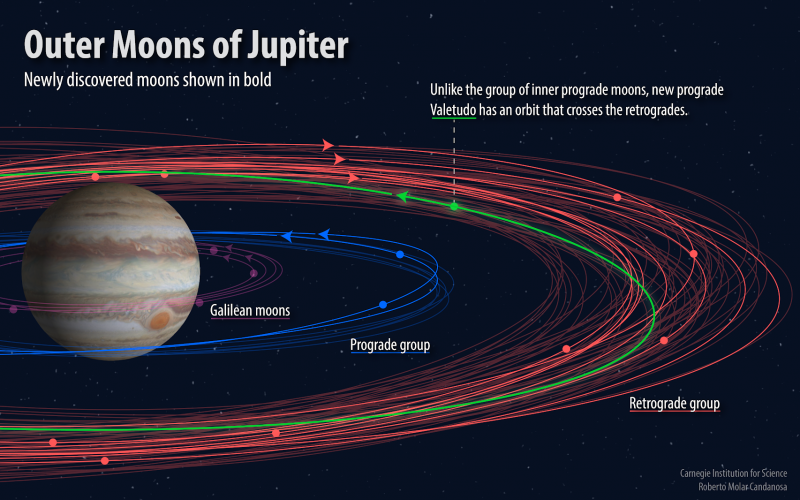 The two other moons revolve around Jupiter in a closer, regular orbit. As they have similar orbital distance and angles of inclinations around Jupiter, they are thought to be fragments of a larger moon that broke apart. The final moon is Jupiter's smallest known moon, being less than one kilometre in diameter. Orbiting farther from Jupiter than the two inner moons, this moon orbits prograde (in the direction of Jupiter's spin) and crosses the outer retrograde moons. As a result, head-on collisions are much more likely to occur between this oddball moon and the retrograde moons. It is believed that this smaller prograde moon could be the last visible remnant of a once-larger prograde-orbiting moon that formed some of the retrograde moons visible today during past head-on collisions. The new moons were first seen in March of last year from the Cerro Tololo Inter-American Observatory in Chile, but it took more than a year to confirm that the bodies were indeed locked in orbit around the planet. “Jupiter just happened to be in the sky near the search fields where we were looking for extremely distant Solar System objects, so we were serendipitously able to look for new moons around Jupiter while at the same time looking for planets at the fringes of our Solar System,” said Scott S. Sheppard, the team lead at Carnegie.